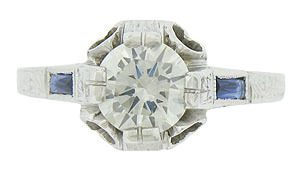 This spectacular Art Deco engagement ring features a gorgeous 1.04 carat, H-I color, Si2 clarity round cut diamond. A pair of baguette cut sapphires stretch along the rings shoulders. 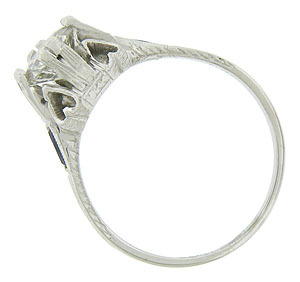 Elongated prongs reach from the sides of the mounting, while abstract floral engraving decorates the sides and shoulders of the ring. Bold cutwork hearts slice into the domed sides of the mounting. 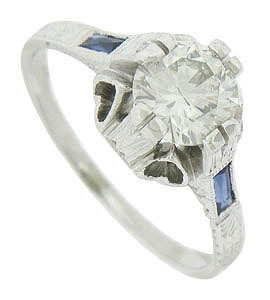 The antique ring is fashioned of 18K white gold and measures 9.90 mm in width. Circa: 1920. Size 7 1/4, domed. We can re-size.